This Sign Supply Set is a Cable and Acrylic Panel System for Ceiling Suspended Signage! Posters and Company Graphics are More Effective When Hung Over Head! 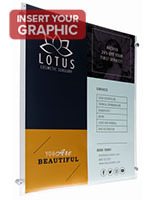 Buy a Modular Sign Supply Kit from Our Online Catalog and Save with Wholesale Bargains! Cable sign panel has (2) s-hooks for connecting to other units. 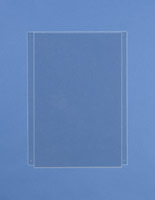 Acrylic construction is precision laser cut for quality. Cable sign panel is double-sided for hanging in a storefront window. Compatible with KITCH60 ceiling mount hardware kit [sold separately]. 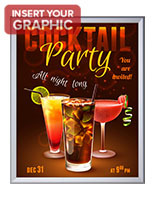 This 22" x 28" cable sign panel, called a poster hanger, connects to other frames! This series of window display mounts to the ceiling for placement infront of a window or central location. 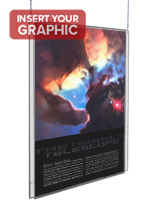 The cable sign panel for 22" x 28" posters comes with (2) s-hooks for linking to other frames. 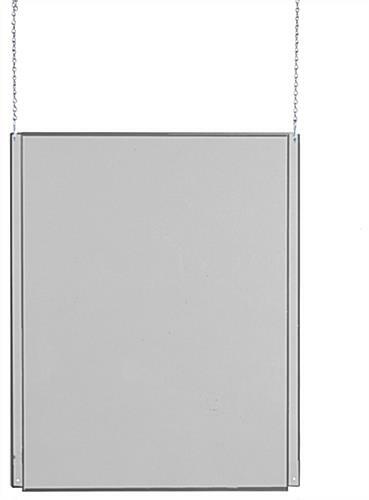 However, ceiling mount hardware is not included with the purchase of these hanging frames. This cable sign panel that hangs from the ceiling will only connect to poster hangers with pre-drilled holes the same distance apart. 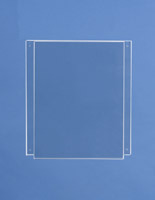 A list of compatible acrylic frames and accessories can be found below. 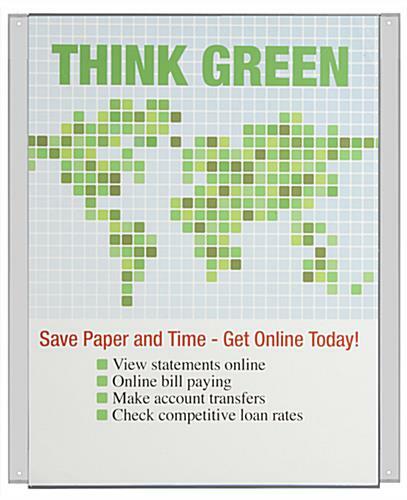 This cable sign panel that holds 22" x 28" advertisements is made from a single sheet of 1/8" thick clear acrylic. 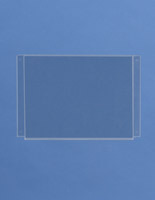 The acrylic construction is affordable and coordinates with almost any commercial environment. Posters load into the top of this cable sign panel, which makes updating advertisements quick and easy. Users can place (2) posters back-to-back in these acrylic frames. These poster hangers exhibit a large print, which is ideal for advertising in establishments such as grocery stores and retail stores. 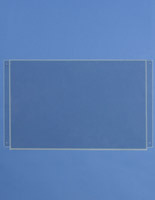 This acrylic frame is ideal for any business in search of an affordable way to hang posters from the ceiling. Signage support systems mounted to the ceiling allow users to place advertisements practically anywhere, not just on a wall! Orders of these poster hangers will ship same day when in-stock and ordered prior to 1PM EST, Monday – Friday!